Born December 4, 1966 in Hattiesburg, Mississippi, U.S.
From Wikipedia, the free encyclopedia. 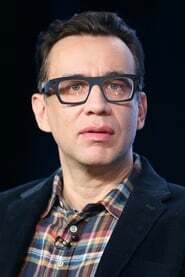 Alfredo "Fred" Armisen (born December 4, 1966) is an American actor, comedian and musician best known for his work as a cast member on Saturday Night Live, and portraying off-color foreigners in various comedy films such as EuroTrip, Cop Out or Anchorman: The Legend of Ron Burgundy. With Carrie Brownstein, he is the co-creator and co-star of the IFC sketch series Portlandia. Description above from the Wikipedia article Fred Armisen, licensed under CC-BY-SA,full list of contributors on Wikipedia. as "Death to Aladeen Restaurant waiter"
as "Lawrence Welk / Various (archive footage)"
as "Philosophical and Hymn-Singing Astronaut"